Courtesy of Keller Williams Realty Rivertown, Rachel R Major. This corner penthouse is an unparalleled example of contemporary style, function & versatility that downtown buyers look for in a living space. Enjoy floor to ceiling windows, with breathtaking views of downtown Grand Rapids from your living room. Watching the sunset in the evening from one the 2 private decks. This 2 story penthouse is different from all other Union Square condos featuring Polished contemporary concrete floors, bamboo floors, Ceasarstone counter tops throughout, a custom inlaid island counter top, upgraded wenge cabinets, an imported Italian staircase, a Maax Urban soaking tub w/ a cascading waterfall in the master suite, European Stainless appliances and a one-of-the-kind ceiling suspended gas Orb Stainless modern fireplace. The list goes on… Surround sound wiring w/ speakers and a full size LG Washer and Vented Dryer are already installed. Never have to go outside to get your car! 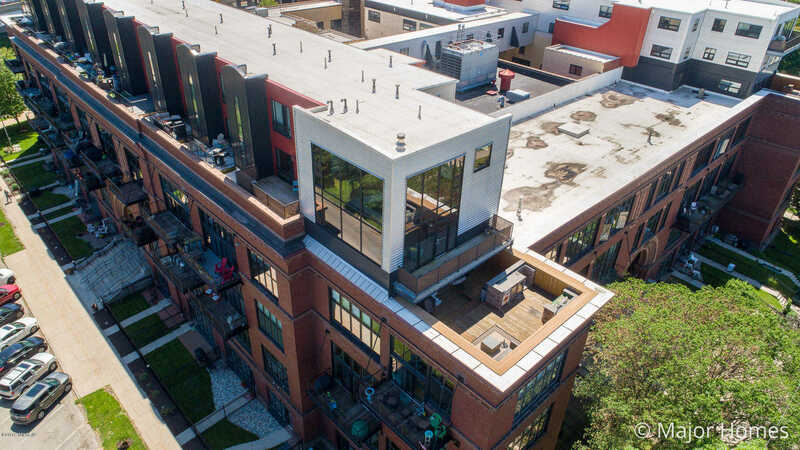 All this with the incredible amenities that living in Union Square offers such as the roof top pool, deck, hot tub, clubhouse and workout facility. Take advantage of the incredible opportunities that the REN ZONE NO TAX benefits offer you today. Live here in luxury and save. Call for a private showing today!